Apple's updated iMacs have the option of shipping with the all-new Magic Trackpad 2, which features a larger surface and features Force Touch input, bringing it in line with Apple's latest MacBook Pro and 12-inch MacBook with Retina display models. The new Magic Trackpad features a 29 percent larger surface that can be clicked anywhere, just like the Force Touch trackpad on the latest MacBooks. The previous design featured a physical clicking design, but the new one simulates the sensation with Apple's proprietary Taptic Engine. It has a flat, white edge-to-edge glass top featuring four force sensors underneath. Apple says the new Magic Trackpad 2 can detect subtle differences in the amount of pressure a user applies. The new design also features a lower profile than its predecessor. Apple has also included an integrated battery in its Magic Trackpad 2, which is rechargeable via the proprietary Lightning port already used on iPhone and iPad. 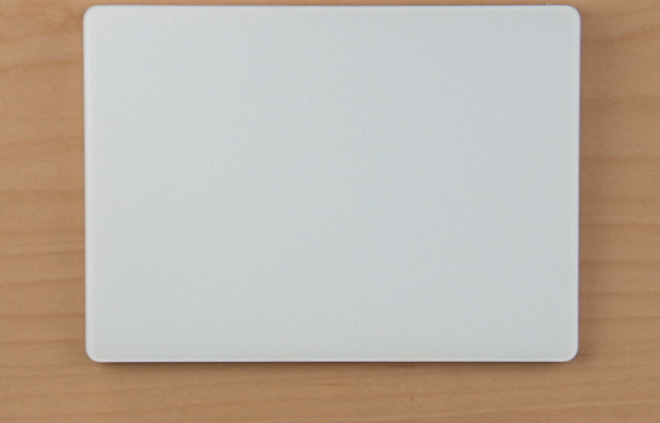 Apple says the Magic Trackpad 2 battery lasts about a month before needing to be recharged. The revamped Bluetooth 4.0 Magic Trackpad is priced at $129, a significant increase from the previous first-generation model at $69.